Note: TLS Season 3 will be played on TeamLiquid Legacy Server. To learn how to connect to the TLS, read the second reply below. The Legacy returns and the competition is stiffer than ever in this final open season. This has been an exciting year for the Brood War community. 2012 ended with little besides the conspicuous absence of the recently euthanized professional scene. Yet players worldwide kept on playing, and the competition continued. Sonic's Starleagues have grown in size and recognition, reintroducing us to a Korean scene of unmatched skill. And since the introduction of the TeamLiquid Legacy Starleague at the beginning of the year, the foreign scene has learned the names and styles of the talented heroes that continue to fight on the plains of Aiur. Season Three starts next week, bringing with it another opportunity to unseat the undisputed king of the foreign scene and reigning champion, the Hungarian Zerg known as Sziky. On the line is a $500 prize pool and a last shot at direct qualification for the $2000 championship. There will be no lack of excitement when the final regular season of the tournament starts next week. Thank you for supporting TLS, without our viewers none of this would be possible. The third season of TLS will have a prize pool of $500. Following this tournament there will be a championship event with $2000 up for grabs! The third season of TeamLiquid Legacy Starleague will have a similar format to the second season. Season 3 will have four qualifiers. 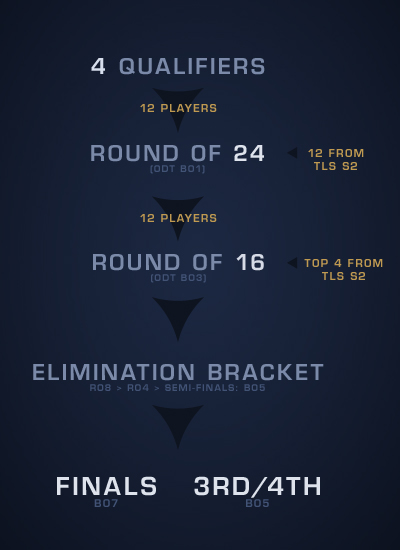 Players who reached Round of 16 in TLS Season 2 will be seeded to the Round of 24, and the top four from TLS Season 2 will be seeded directly into Round of 16 in Season 3. As in TLS Season 2, only winners of four qualifiers will be seeded directly to the Ro24. The remaining eight players from qualifiers will be filled based on points accumulated during the qualifiers. Joining the players who qualify through qualifiers will be 12 players who were at 5th-16th place in the TLS Season 2. In TLS Season 3, each Ro24 group will be played with best-of-1 and each Ro16 group will be played with mixed best-of-1 and best-of-3 Dual Tournament (ODT) format, seeding players into an eight man best-of-5 single-elimination bracket. Check-in for each Qualifier starts at 14:00 GMT (+00:00), and closes at 15:00 GMT (+00:00) on each day. Be sure to show up and be ready to play your matches! Note: Please note that the time of the qualifiers is now one hour ealier than it was in TLS S1 and S2. As mentioned earlier, there are 12 places attainable through 4 open qualifiers. 4 positions for the winners of each qualifier, and another 8 to those who earn their place through the points system. Remember that only one player makes it out of each qualifier this time so the finals are of extreme importance. There will be a one week break after the qualifiers and Round of 24. In this week, we'll do a group selection and decide tiebreakers, if necessary. Full rules and details including how points and tiebreaks are handled can be found on the registration page, as well as posted below. It is your responsibility to read and adhere to these rules. One of the finest maps of 2008, and a staple in competitive foreign Brood War, Destination makes its debut in TLS next week. This well-traveled battleground will encourage mech play from Terran, lurker contains from Zerg, and whining aggression from Protoss. This two-player map offers ample opportunity for cheesy openings and strongly favors well-prepared players. Though perhaps the least recognized map in the TLS3 pool, Polaris Rhapsody brings some healthy variety to the competition. This 2010 Proleague map provides multiple expansion patterns in addition to a narrow path directly between naturals. Polaris Rhapsody is the second two-player map for the season and is historically strong for protoss. 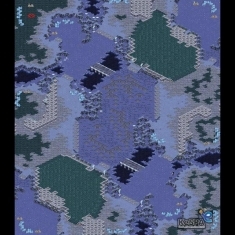 Beautifully asymmetric and visually complex, Neo Aztec is perhaps the most aesthetic entrant to this season's map pool. This three-player map may draw players to heavy drop play to avoid a heavily contested center. Pun intended. This updated version attempts to address a perceived imbalance against Terran, but should still be a welcome sight for the tournament's Zerg players. Andromeda introduces to the map pool a Proleague stalwart and fan favorite. 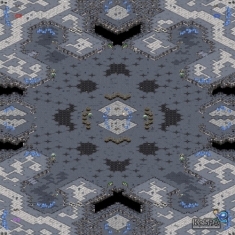 This battleground encourages more unorthodox openings, such as Corsair/Reaver PvZ and one-base tech TvZ. Andromeda is a well-balanced map that tends to host long macro games in all match ups. The map that needs no introduction returns this season. Fighting Spirit encourages long macro games and is widely considered the most balanced and standard map in existence. While no race can be said to be favored on this jungle map, ladder warriors will be at home on this popular practice arena. Qualifiers are played at 15:00 GMT (+00:00). Tournament broadcasts begin at 17:00 GMT (+00:00). Note: The broadcast times are now two hours earlier than in TLS S1 and S2. Tune in this weekend, Saturday, Sep 14 5:00pm GMT (GMT+00:00) and Sunday, Sep 15 5:00pm GMT (GMT+00:00), for the opening set of qualifiers. Time to continue the legacy. Who can qualify for the 12 spots? If I win a qualifier can I play in the others? No, you cannot. You cannot secretly play under another name -- this will result in disqualification from the TLS and future TL events. Banned users (for any reason) cannot enter these tournaments. Do not try to circumvent by creating smurf accounts. We will find you, and you will be disqualified from the TLS and future TL events. Can I enter all four qualifiers? Yes. Anyone who can enter one qualifier can enter all four. You do not have to play all four, but your chances increase as you play more. What is the Map Pool for the TLS Season 2? 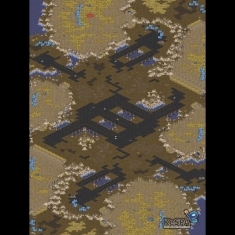 Ro16 will use map pool: Polaris Rhapsody, Andromeda, and Fighting Spirit. Rest of the tour will use all five maps, which are from the latest iCCup map pack (2.5) and are available to download here. Any sort of cheating may result in disqualification from the TLS and from future TL events. We take cheating very seriously, and we will hand out harsh punishments. Why don't you allow everyone including Chinese/Koreans to participate? The unfortunate truth is that we aren't prepared for the logistics of such a situation. We haven't run a tournament using this system in Brood War before and frankly we're rusty at administering these sorts of events. Having a large group of players who may have difficulty communicating with players or admins is not a scenario where we can guarantee success at this point. Plus, they have SOSPA and the SSL. ODT? How does that work? Tournament will be held on the TLS Server. Do not register unless you can play on the TLS server. Instructions for access are provided below. Setting up the TLS Server: . Make sure you have either Chaoslauncher for 1.16.1 or wLauncher installed on your computer. Download the TLS Plugin for Chaoslauncher 1.16.1. Save this file into the folder containing the Chaoslauncher application; or if you're using wLauncher, save this file in the Plugins subfolder of your wLauncher folder. Run Chaoslauncher/wLauncher as an administrator. Check the box next to TLS Plugin (1.16.1). Click the start button. The TLS server will be listed in the Multiplayer screen. You can create an account using the in-game interface. Make sure that you host your games with #LL or #L2 in title to enable Lan Latency. Bracket will be displayed on TeamLiquid. Participants must log in to view opponent IDs to contact their opponents for matches. Players must contact each other through in-game chat and arrange a host (unless Ro4 or later). From Ro8 on, TL referees will host the game. Winners will report results and upload replays after each round. If a game's results are disputed (both players report win), Tournament Referees will check replays and determine who advances. Best of 1 until Round of 8. Best of 3 in Ro8, Ro4 and Finals. Players are permitted to stream or cast games up to the semifinals, streaming or spoiling the semifinals or final series will result in disqualification. Players may not have any stream open in the background when playing. Any violation of TLS Qualifier Tournament Rules may result in game forfeit and future suspension from TLS Qualifiers and other TL events. No cheating in any way. This includes any sort of hack or illegal program and receiving messages from friends watching the stream. This also includes account sharing or playing under an ID that you did not register under. Players must set status to /dnd during tournament matches. Players must arrive within 10 minutes of the end of the previous round. After 10 minutes, every 10 minutes is a game loss for the player who is not present. Ex: with one player present for 20 minutes, 1-0, 30 minutes, 2-0. If your opponent is not present for 20 minutes, please PM TLTourAdmin. Players may change race between games. Players may not play in another tournament that conflicts with TLS Qualifier play time. Referees may disqualify players that delay the TLS Qualifier due to scheduling conflicts. Referees may warn and disqualify players for chat violations, including excessive or abusive insults toward players, observers, or referees. Games will be hosted on one of the approved maps from the iCCup map pack. In a Bo1 games, host must create on designated map for that round. Maps cannot be played twice in a series. It is the player's responsibility to check the map pool. If a player protests an incorrect map after playing a game on it, the game will not be replayed. If neither of the players can host, contact the referee who will host the game for you. Download: The maps used in this tournament are from the latest iCCup map pack (2.5) and are available to download here. Due to lag conflicts, we may swap players in the bracket to resolve issues. This means that even if you receive a bye you may be swapped in for a match that round. This will not increase your number of games played. If your opponent is disconnecting, players should take a screenshot of the lag screen and contact the tournament referee. If a disconnect happens in the first five minutes and there has been no player-opponent contact, game will be replayed. In a Bo1, if a disconnect happens after player-opponent contact, disconnecting player may receive a loss. The Referee will make the final decision after reviewing the screenshot and replay. In a Bo3, if a disconnect happens after player-contact, player must contact Referee immediately and Referee will decide how to proceed after reviewing the evidence. Referees and Tournament Administrators reserve the right to overturn results or award wins based on evidence they see. In a disconnecting situation, both players can agree to a regame. If there is persistent unplayable lag (lag screen comes up more than once in a short time), players must contact a Referee who will decide how to proceed. TL will officially cast both semifinals and the finals. No observers are allowed in games other than those designated by TL. TL will designate "approved" observers who will be allowed to observe and broadcast games. TL referees are also allowed to be in game. There will only be a maximum of one observer in each match. If a non-approved observer joins the game and the host starts, game does not count. If game lags with an approved observer in game, that observer must leave at the request of a player. If a TL referee is in game, he will make this decision. Observers and broadcasters are subject to the same rules for cheating and abuse as players. TL may suspend observers from future TL events if violations occur. Not to mention that Elegant is back. Terrible choice of maps, but I can't wait! Keeping Broodwar relevant since season 1. Nearly perfect map pool? Check. TLS2 just wasn't the same without Elegant there. I think I'm gonna go shed some manly tears of joy now. Awesome. It will be another great tournament hosted by TL. Oh yeah! Destination will be cool to see again, I fear Aztec on behalf of the already too scarce terrans though. Wait why only 4 qualifiers? I thought we were having 6. What ever happened to the other 2? Did staff not like that system anymore? Did the amount of BW players drop or something in comparison? Disappointed in the map pool. They should have thrown in Baekmagoji, and Wuthering Heights to get rid of all the zerg players.